Looptate Games - Welcome to Logic28 Games! Logical Analysis can help us understand more about what happens around us. Logical Analysis can also help us master Math and Science. Logic28 is a game to practice Logical Analysis. In each round, the player is given four positive integers less than 10. The goal is to use these 4 numbers to make an expression equal to 28. To do this, we can follow 3 basic steps. For example, consider the numbers 1, 2, 3, and 4. Step 1: Determine the correct order of these four integers. 1, 2, 3, and 4 is the correct sequence. Step 2: Insert one of four operators: +, -, *, and /, between each pair of integers in the sequence. For this example, we will insert +, *, and * to obtain 1 + 2 * 3 * 4. Step 3: Determine the proper order of operations. Without any parentheses, 1 + 2 * 3 * 4 equals 25. To make the expression equal 28, we need to insert a pair of parentheses as follows: (1 + 2 * 3) * 4, so that the addition will be carried out before the second multiplication. Let's try a second example using 1, 2, 7, and 9. Step 1: Arrange the sequence as 9, 1, 2, and 7. Step 2: Insert -, /, and * to obtain 9 - 1 / 2 * 7. Step 3: Insert one pair of parentheses to obtain (9 - 1) / 2 * 7, which is equal to 28. Logical Analysis can help us understand more about what happens around us. Logical Analysis can also help us master Math and Science. Logic28 is a game to practice Logical Analysis. In each round, the player is given four positive integers less than 10. The goal is to use these 4 numbers to make an expression equal to 28. To do this, we can follow 3 basic steps. For example, consider the numbers 1, 2, 3, and 4. Step 1: Determine the correct order of these four integers. 1, 2, 3, and 4 is the correct sequence. Step 2: Insert one of four operators: +, -, *, and /, between each pair of integers in the sequence. For this example, we will insert +, *, and * to obtain 1 + 2 * 3 * 4. Step 3: Determine the proper order of operations. Without any parentheses, 1 + 2 * 3 * 4 equals 25. To make the expression equal 28, we need to insert a pair of parentheses as follows: (1 + 2 * 3) * 4, so that the addition will be carried out before the second multiplication. Let's try a second example using 1, 2, 7, and 9. Step 1: Arrange the sequence as 9, 1, 2, and 7. Step 2: Insert -, /, and * to obtain 9 - 1 / 2 * 7. Step 3: Insert one pair of parentheses to obtain (9 - 1) / 2 * 7, which is equal to 28. 1. Press the sound button to turn on and off the sound. 2. To swap two integers: touch the first integer and then touch the second one to swap them. 3. To insert the operator: touch one of these three buttons: Circulate First Operator, Circulate Second Operator, and Circulate Third Operator. 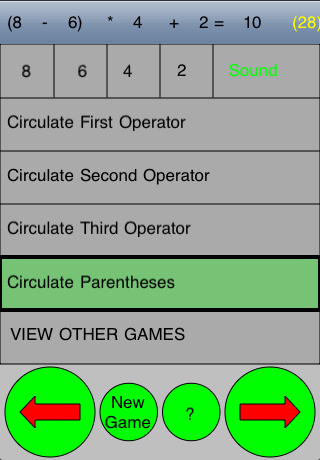 Then touch one of the arrow buttons in the bottom to circulate the operators: +, -, *, and /. 4. To insert the parentheses: touch the Circulate Parentheses button and then touch one of the arrow buttons in the bottom to circulate the parentheses.